Bibliography: Man 93 (Zigrosser, Prints, PCA, 1962). Related Works: See West’s etching, DAC 1964.16.1; Heath’s lithograph is in reverse. 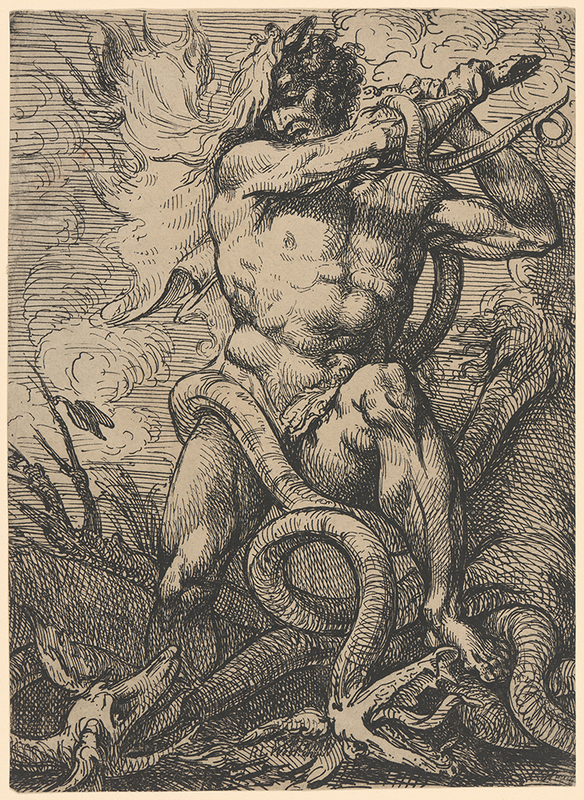 Hercules Slaying the Hydra, . Pen lithograph on heavyweight wove paper. Image: 323 x 235 mm (12.7 x 9.3 in.). Sheet: 323 x 235 mm (12.7 x 9.3 in.). DAC accession number 1983.5.1. Friends of the Davison Art Center funds, 1983. Open Access Image from the Davison Art Center, Wesleyan University (photo: T. Rodriguez). http://dac-collection.wesleyan.edu/obj6915 is a persistent link to this page with no user-session information.